The New Hampshire State Council on the Arts, in partnership with the Monadnock Folklore Society and the Monadnock Center for History and Culture, is sponsoring an exhibit about the Granite State’s tradition of social dancing at the New Hampshire State Library from Oct. 14-Nov. 25, 2015. “Traditional Dance and Music in New Hampshire: 1750-today” traces the long history of contra and social dance music throughout the region, especially in the southwestern part of the state. Irish, Scottish, English and French Canadian traditions all contribute to New Hampshire’s dance traditions. Dances are similar to square dancing but are generally performed in lines to live music played by fiddles and piano. Banjos, mandolins and guitars may also be heard at contra dances. Community social dances have been happening in New Hampshire continuously since before the Revolutionary War. The exhibit features artifacts, documents, instruments, photographs and audio recordings. There is no charge to view the exhibit. The New Hampshire State Library is open Monday-Friday, 8 a.m.-4:30 p.m. A public reception will be held Wednesday, October 14, 5:30-6:30 p.m.
For more information about “Traditional Dance and Music in New Hampshire: 1750-today,” visit nh.gov/nharts. The New Hampshire State Council on the Arts is a division of the New Hampshire Department of Cultural Resources. It began in 1965 with legislation designed “to insure that the role of the arts in the life of our communities will continue to grow and play an ever more significant part in the education and welfare of our citizens.” Funding for programs is provided through state appropriations, a partnership with the National Endowment for the Arts and the Conservation License Plate fund. Learn more about the New Hampshire State Council on the Arts at www.nh.gov/nharts. The Monadnock Center for History and Culture has received a grant from the New Hampshire Humanities Council to present “Contra Dancing in New Hampshire — Then and Now” by Dudley Laufman on Saturday, March 14th at 10:00 AM, in Bass Hall at 19 Grove Street in Peterborough, NH. Since the late 1600s, the lively tradition of contra dancing has kept people of all ages swinging and sashaying in barns, town halls and schools around the state. Contra dancing came to New Hampshire by way of the English colonists and remains popular in many communities, particularly in the Monadnock Region. Presenter Dudley Laufman brings this tradition to life with stories, poems and recordings of callers, musicians, and dancers, past and present. Live music, always integral to this dance form, will be played on the fiddle and melodeon. Presenter Dudley Laufman received the highest honor for traditional artists, the National Heritage Fellowship, in 2009. He received the 2001 NH Governor’s Arts Award for Lifetime Achievement. 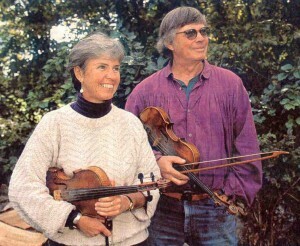 In 1999, Laufman and Jacqueline Laufman presented at the Smithsonian FolkLife Festival in Washington, DC. 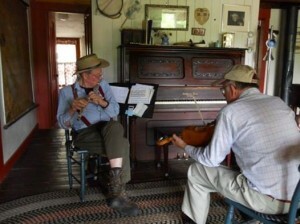 Laufman has been playing fiddle and calling for contra and square dances for 64 years. With his wife, Jacqueline Laufman, he authored Traditional Barn Dances and recorded several CDs. The presentation is part of the exhibit running through May at the Monadnock Center for History and Culture, titled “Gents Bow, Ladies Know How: Traditional Dance and Music in the Monadnock Region 1750-2015.” The exhibit traces the long history of traditional dance and music in southwestern New Hampshire from Colonial times to the present. For more information call 603-924-3235 or visit www.MonadnockCenter.org. The Monadnock Center for History and Culture and the Monadnock Folklore Society present Randy Miller speaking on the topic of “The Music of John Taggart” on Saturday, February 7th at 5:30 PM, in Bass Hall at 19 Grove Street in Peterborough, NH. The talk is based on “Recollection of a Busy Life, the memoir of John Adams Taggart (1854–1943).” In it, Taggart portrays in rich detail his childhood, his family’s way of life, and many of their neighbors in the town of Sharon, New Hampshire. He was the fifth generation Taggart to reside in Sharon. His father, Phineas Taggart (1812–1892) was a fiddler and dancing master in the 1830s and ’40s, teaching in all the surrounding towns. 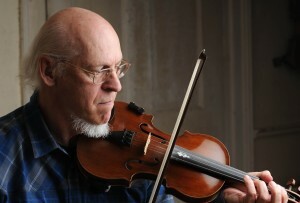 Presenter Randy Miller is a fiddler and artist based in Alstead, NH. His music book, “The New England Fiddler’s Repertoire,” written with Jack Perron, is considered the best contemporary collection of New England fiddle tunes. The exhibit is sponsored by The Animal Care Clinic-Monadnock, with grant funding from the New Hampshire State Council on the Arts. The Monadnock Center for History and Culture is a community museum that has been dedicated to preserving and celebrating local history and culture since its founding in 1902. 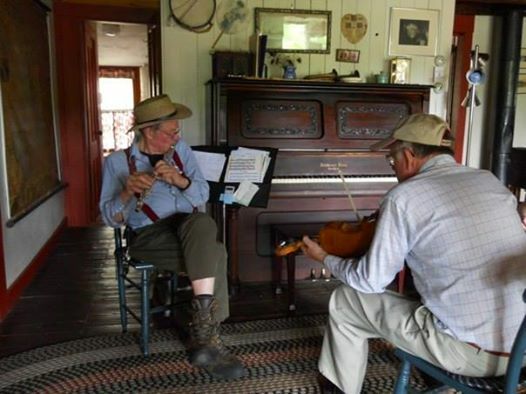 The Monadnock Folklore Society was founded in 1980 to increase the visibility of folk dance and music events in southern New Hampshire and provide educational services in the folk arts to the community. The Country Dance and Song Society is a national leader in promoting participatory dance, music and song that have roots in English and North American culture and their living traditions. The 28th Annual Ralph Page Dance Legacy Weekend (RPDLW) is being held at the University of New Hampshire on January 16, 17 and 18, 2015. 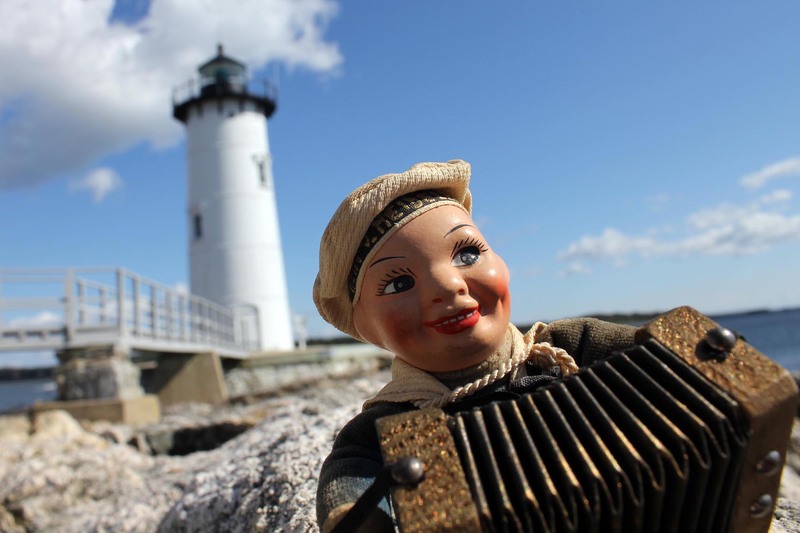 The annual three-day event features some of the finest callers and musicians from New England and across the country, and provides people of all ages and abilities the opportunity to dance and socialize in a warm and friendly setting. The RPDLW runs from 7:30pm on Friday evening until 4:00pm on Sunday afternoon. Attendees can register for the entire weekend, or pick-and-choose the sessions of interest to them. Both pre- and on-site-registration is available. The RPDLW takes place at the Memorial Union Building on the campus of the University of New Hampshire in Durham, NH. A complete schedule of events and registration information can be found at www.ralphpage.neffa.org. Callers for the 2015 RPDLW are three well-known and accomplished professionals; David Millstone (also current President of the Country Dance and Song Society), Carol Ormand and Mary Wesley. Each of these dance masters is known for their clear calling style and genuine connection with the dancers. David, Carol and Mary will be accompanied by three fabulous bands: Rodney Miller and Friends (Rodney Miller, David Surette and Gordon Peery); Riptide (Alden Robinson, Owen Marshall and Glen Loper); and the Sugar River String Band (Jane Orzechowski & family and Deanna Stiles), for the Friday night dance. role of this organization, and their contributions & influences to the world of traditional dance. musicians on staff for this Weekend. the New England Folk Festival Association (NEFFA), and the Milne Special Collections at the University of New Hampshire Library. o $13 each: Fri. evening; Sat. morning; Sat. afternoon; Sun. morning. o $8: Sun. afternoon. o Children under 12 are free. o See web site for additional discount opportunities! For more information on the Weekend, its schedule and registration; please go to www.ralphpage.neffa.org. Further details may also be obtained by contacting Dave Bateman, Ralph Page Committee Chairperson, at 603-397-0042 or rpdlw.registrar@comcast.net. The Monadnock Center for History and Culture and the Monadnock Folklore Society jointly present an exhibit that will open on January 24th, 2015 and run through mid-May. The exhibit demonstrates that traditional dance and music, primarily contra and square dance, have been part of the regular lives of residents of the Monadnock region in southwestern New Hampshire since the time of the Colonial settlements in the mid-1700s. The exhibit explores the living history of traditional dance and music through audio, newspaper articles, musical instruments, and books, as well as a series of public events. Monadnock Folklore Society’s annual presentation of this seasonal favorite! Absolutely the best way to start your holiday season. Music, dance, a mummer’s play and delicious treats! Nowell Sing We Clear with its unusual songs, carols, stories, and customs has toured every year since 1975. Drawn mostly from English-language folk traditions, the songs tell both a version of the events and characters involved in the Christmas story and detail the customs which make up the twelve magical days following the return of the light at the winter solstice. Many of these ancient customs are the basis of the today’s holiday traditions, such as visiting and feasting, gift-giving, carol singing from door-to-door and the adorning of houses and churches with garlands of evergreen. While much of the singing is done in unaccompanied style, the pageant is also stamped with the energetic dance band sound of fiddle, button accordion, electric piano, drums, and concertina. The audience will be supplied with song sheets and encouraged to sing along, though after three decades of touring in New England, a whole generation of young people have grown up with these songs and carols and sing along with as much as they can. Some “new”, that is “different”, songs and carols are introduced every year. 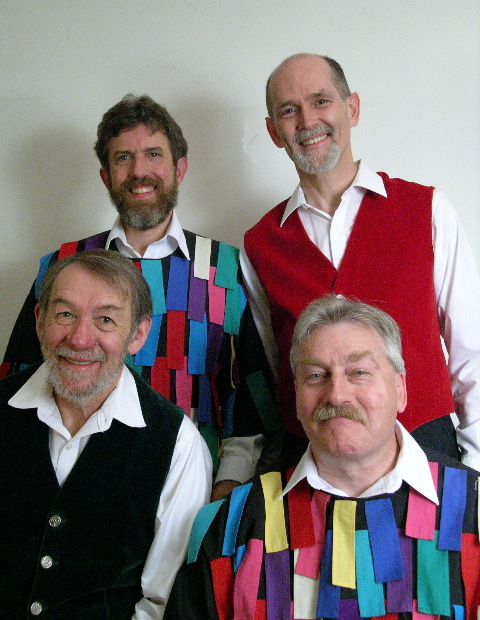 Performers are John Roberts and Tony Barrand, widely known for their lively presentations of English folk songs, and Fred Breunig and Andy Davis, well known in New England as dance callers and musicians. Nowell Sing We Clear has become a regular part of some communities on the Eastern seaboard.This year the ensemble will be playing as far south as West Chester, PA, and as far north as Brattleboro, VT. The group has several recordings of songs from the show which have been popular items in many households at this time of year. Their CDs are drawn from songs learned for their concerts: The newest is Nowell, Nowell, Nowell. Others are Just Say Nowell, Hail Smiling Morn (which has a cover designed by famous Vermont artist, Mary Azarian), Nowell SingWe Four, and Nowell, Nowell, Nowell. The first three LP recordings are all well represented on a compact disk, The Best of Nowell: 1976 – 1985 All recordings are available from Golden Hind Records. Acclaimed by the Boston Globe as “the finest folk ballad singer America has produced since Joan Baez,” Connie Dover is a singer, poet and Emmy Award-winning producer and composer. Her soaring, crystal-clear voice and inspired arrangements of the music of Scotland, Ireland and early America display a depth and breadth of range that have established her as one of the world’s pre-eminent traditional singers. The Nelson Shape Note Singers will perform at 2 PM on Sunday August 17th. It is with great sadness that we share the news that Renn Tolman passed away on July 5th in Homer, Alaska. Renn was born in Nelson, the son of Newt and Beth Tolman. Newt played flute for the Nelson dances and with Kay Gilbert, compiled “The Nelson Collection” of fiddle tunes. The book was used by many musicians in later years to fuel the revival of traditional dance and music. Beth collaborated with Ralph Page to write The Country Dance Book, a collection of dances from the Monadnock Region. Renn learned to play the flute from his father. He brought traditional New England style dance to Homer, Alaska. In addition, he returned to Nelson regularly where his turn on the stage was always eagerly awaited.